We have looked at the pintle and nozzle with the remarkably tight clearance between them. 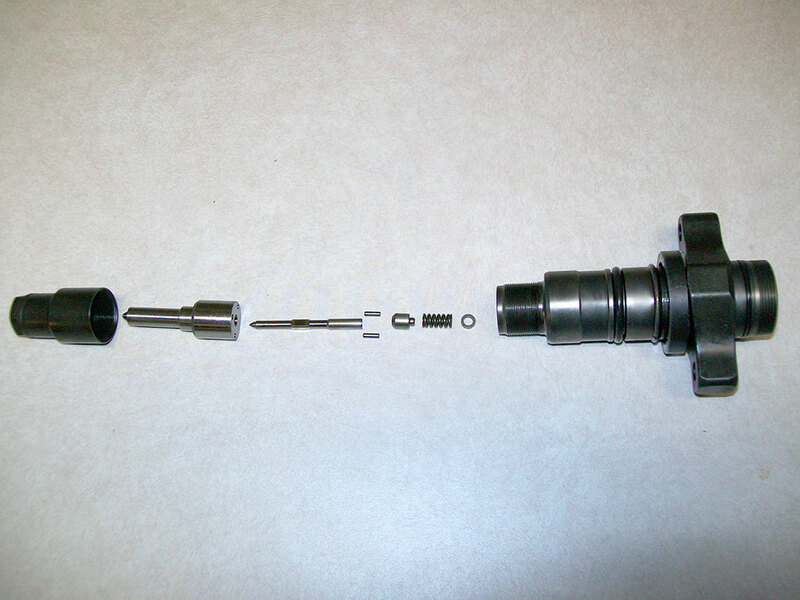 Here are the components of the HPCR injector, first the bottom half with the nozzle nut, nozzle, pintle, and the main body to the right. Next is a photo of the top half with the armature to the left, check ball and seat in the center, and the solenoid and its nut to the right. Next is a close up of the armature that was on the left of the preceding photo. You can see the buildup of sludge on it from contaminated fuel. 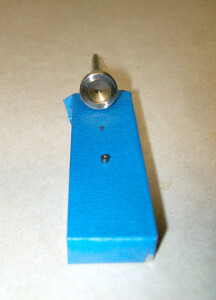 Finally, on a one-inch wide block you can see the fuel return seat, ball check (.053” diameter) and the end of the armature that fits to the fuel return check ball. A technician needs 500x magnification to inspect the ball, cup, and the seat in the armature for wear or erosion. 72i16. 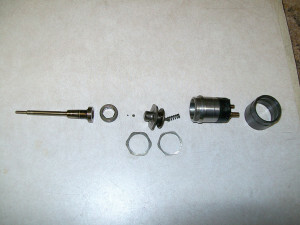 Disassembled bottom half of HPCR injector. 72i17. Disassembled top half of HPCR injector. 72i18. 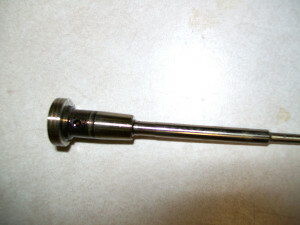 HPCR injector armature showing built up sludge. 72i19. Fuel return seat, check ball, and end of armature. 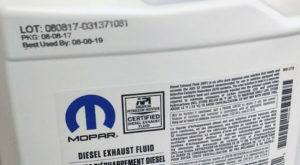 The electric fuel transfer pumps used in 2003-2004 engines [photo 72i5] may not be adequate for more than a gain of about 60-70hp over stock. 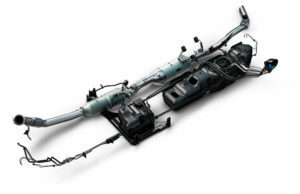 The in-tank 2005-up lift pump has a slightly better reputation for fuel delivery and a noticeably better reputation for longevity. These lift pumps were covered in detail in Issue 56, pages 60-74. If your Turbo Diesel comes with an electric lift pump, add a spare to your “boonie box” and monitor the performance of your lift pump with an electric gauge (so you won’t have diesel fuel in the cab). 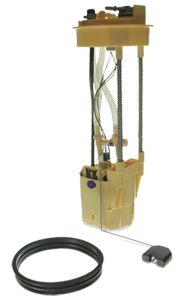 There are also aftermarket lift pumps, with or without extra fuel filtration. The FASS 200 gallon per hour lift pump and filtration system was described in Issue 56, page 102. The EGT range of most Turbo Diesel engines with stock turbos likewise may or may not remain safe with up to 60-70hp more, depending on load, altitude, ambient temperature, etc. However, these two components may be closer to “maxed out” with typical hop-ups on newer Turbo Diesels than the older trucks were. In part this is because the older trucks started with lower horsepower levels. Check your fuel pressure gauge and see if the lift pump pressure stays around 5 psi or so under full power. See if EGT get too high under full power and and/or heavy loads. Maximum EGT is 1450° for 2003-‘04 and 1500° for 2004.5-up engines. For safety, it is a good idea to stay well under these maximums, particularly for long pulls. With my BD compound turbochargers and intercooler, I can keep EGT below or at 1100° towing a 5000-pound trailer in the mountains at higher altitudes and 70-75mph. In summary, the enemies of the HPCR fuel system are dirt, water, contaminated fuel, and excessive rail pressure. Have we covered everything you need to know? Not quite yet, let’s answer some questions and then finish the article with the removal and installation procedures. 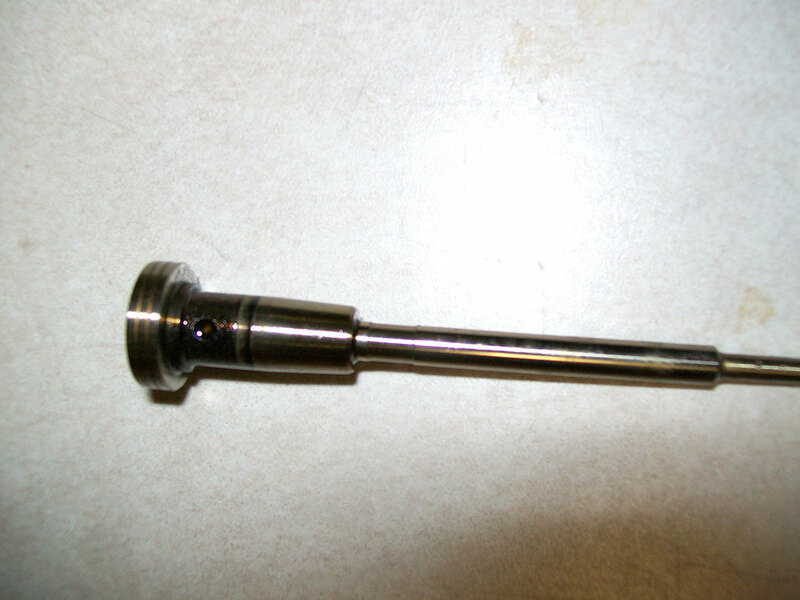 In Part Five, we have a look at frequently asked questions about fuel injectors.